Escape the summer heat in the tree tops of the Smoky Mountains. At Treetop Cabin, you will have everything you need to be cozy and comfortable while you enjoy a true mountain experience. The floor plan was designed to be ideal for three couples, or for a couple with children, all desiring their own private spaces and rooms to be together. This charming mountain cabin has three floors and three bedrooms with the 3rd bedroom being the upstairs loft. 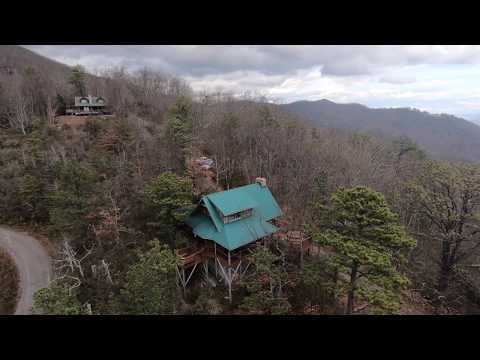 Nestled high in the treetops at 4000 feet, the cabin offers westward views of the Great Smoky Mountains and eastward views towards beautiful Maggie Valley. Enjoy a round of golf at one of many courses in the western North Carolina foothills, fly-fish for trout in an icy mountain stream, raft the tumbling Nantahala or French Broad Rivers, or snowboard down the nearby Cataloochee Ski Resort. Then relax in the evening in the ‘hot tub under the stars’. Access is a on mountain road with packed dirt/gravel. Winter may require 4wheel drive vehicle and/or snow tire chains. Please call the rental office for more information.